Treasure Hunt is the first level of Yoshi's Story. This forest contains many flat stretches of land and few hazards, as it is more of a tutorial than a level. Shy Guys mob the level, and some have set up ambushes, as they leap out from behind trees and shrubbery to attack the baby Yoshis. However, they can easily be defeated by the dinosaurs, and can also be turned into eggs to break objects. One of the level's most unique features is the appearance of Pak E. Derm, a small elephant with a red sign. A few of these enemies can be found around junctions, blocking the heroes' path. However, a Ground Pound can flip the elephants over, allowing the Yoshis to pass through. Yoshi defeating a Pak E. Derm. The level features many fruits hidden throughout the area. Much of this fruit can be found around the beginning of the stage. Sometimes, the fruit is found just sitting around above the ground, in the arms of Shy Guys, or in small bubbles. The player can break these bubbles with their brightly-colored eggs. Not too long before the midway point, the player can also find a small block floating in the air. If hit, the player can see a "Start" flag sticking out of the ground. If they pass it, they are up to the challenge of reaching the goal, found just before the midway point, in a short amount of time. If they do reach the goal fast enough, they are awarded with seven melons, given to them by a Lakitu. 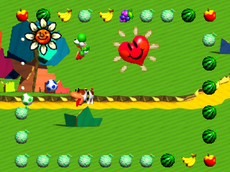 During the second half of Treasure Hunt, a dog named Poochy can be encountered taking the player on a treasure hunt (hence the level's title) through a multi-route area. He stops at a few area, marking where hidden coins and melons can be found. He also shows the heroes where a hidden platform can be found, leading the player to a Heart. If the player Ground Pounds in this area, they are able to dig out the hidden items. Eventually, Poochy stops near a small vase, marking a dead-end, as well as the end point of the level. If the player jumps in the vase, they are brought back to the beginning of the level, where they are able to hunt for any missed fruit. And so the adventure began. The Yoshis set out to find the Super Happy Tree. Poochy the dog helped out. Not even elephants could stop the Yoshis. So far, so good. If they could stay happy, the tree would be saved. In the game Animal Crossing: Wild World, during the La-Di-Day event, one of the new Town Tunes that a villager may use is the beginning of the theme playing in this level. This page was last edited on April 22, 2019, at 15:37.